Chateau / Country House6000 sq. ft.
Beautiful timber frame lodge style home. Views on all sides. Great viewing of mountains, valley, sunrise and reverse sunset. Neighbor is Oregon State Elk Reserve. 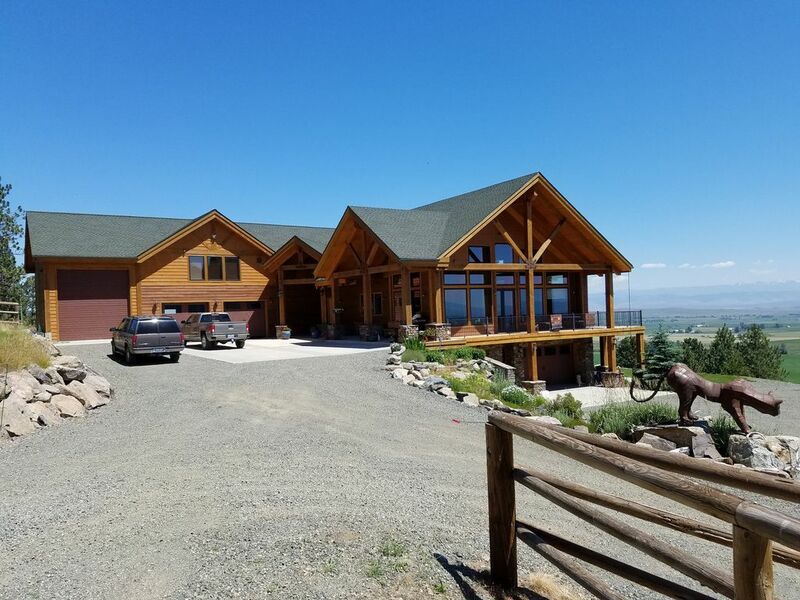 Great bike riding, hiking, elk viewing from wrap around deck. Top of the Elkhorn Mountains with skiing, fantastic scenery, fishing and hiking is only 25 minutes away. Three levels. Private baths in all. Upper level has a bunkhouse feel with bathroom, king bed, 2 full and one upper bunk. Separate bedroom with king and double sink bathroom. Main level has fantastic great room with kitchen and a beautiful master suite with king, 6 foot copper sink, deck hot tub and double sink bathroom. Great view from within and private access to outside deck. Lower level has an expansive studio with spare room, large bathroom and outside access. We have rented this property twice and have enjoyed it each time. Brent is more than accommodating. Thanks Brent!! The views of the valley are priceless and everyone enjoyed coffee on the deck. This lodge is beautiful and has all the amenities that you will need. The house and view were spectacular. Brent is a gracious host who went above and beyond to make sure we were comfortable and didn’t need anything before leaving. Karen is so sweet, she would swing by to make sure the driveway didn’t need plowed and would offer to wash any towels. Overall very pleased with our stay. Thanks so much. It was great having you and I look forward to seeing you again.